If you follow me on Snapchat, Facebook, or Instagram, you'll have seen that I recently made the trip down to Gili Trawangan, an island off of Lombok, Indonesia. I had an amazing time (it has become my favourite beach trip of all time) and I really, really want you guys to share that experience! So I decided to write this 'Top Tips' blogpost, just in case any of you guys were interested in getting to know Gili Trawangan a little bit better. Gili Trawangan is a small island, but not small enough that your feet won't hurt trying to get from one end of the island to the other. 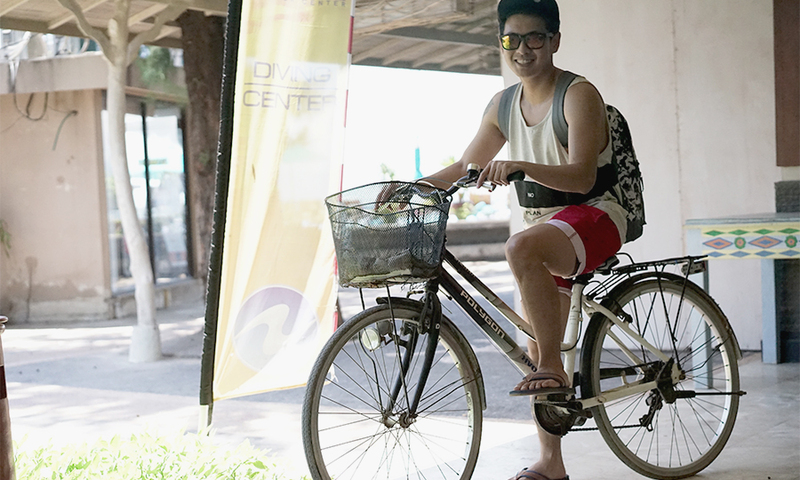 Bike rental places are everywhere, including in the hotels, so grab yourself a bike and visit every corner of the island. Trust me, you're going to want to - which brings me to point #2. Jas thoroughly enjoying himself on the bike he picked out. If you've ever Googled pictures of Gili, you would have likely seen the iconic water swings that everyone goes to visit in Gili. It's on a very isolated part of the island, which is why you'll probably need a bike to get there (if you really want to walk, more power to you! I still needed my bike though). We went in the evening, and trust me when I say, those swirly pastel sunset skies don't get any better than at the swings. Which is great, because when you take a picture at those swings, you're gonna get an absolutely amazing shot! Swings are in the background. Get there a little late so there will be less people - the sunset is still fantastic at that time! 3. Watch out for jellyfish! When we were there, I didn't go snorkelling because I'm not a fan of snorkelling and island hopping (too much sun), but my entire group went, and they were stung pretty badly by sea lice, otherwise know as jellyfish larvae. What you can do to prevent stings after you get out of the water is immediately remove your bathing suit, and don't wear it again until it's been laundered. Do not take a shower with your suit on! Clean water makes them sting more. There are sprays that they sell (though not at Gili, so get them before your trip!) that basically keep these larvae away from you, so be sure you spray it on liberally before you go out into the water, especially between the months of April and August. 4. Stay at my villa! A whole bunch of you were asking me about the villa that I stayed at whilst I was in Gili, and just FYI, I'm not affiliated with them at all. I personally enjoyed my stay there, minus the fact that we found a couple of roaches outside the room (also, in the larger villa where our friends stayed, they shared the premises with a rather large gecko, about the size of a grown man's head). We stayed at the The Trawangan Resort, in a two-bedroom villa. I did not pose for the photo below, it was a pure coincidence! You can't go to Indonesia and not get a massage - it's just not done. There is an abundance of affordable, quality massage parlours in Gili, and I went for 2 massages, one pedicure, and one full-body scrub in the short 5 days that I was there, and it was pure bliss! One massage only costs IDR100,000 (RM30), so it's a really affordable way to kick back and relax whilst waiting for your next snorkel. 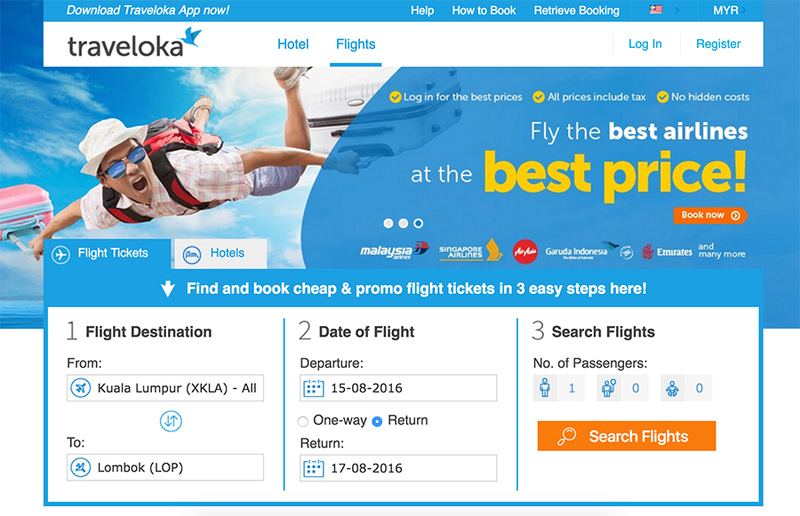 And Traveloka comes up with the prices of all the available flights, all costs included. 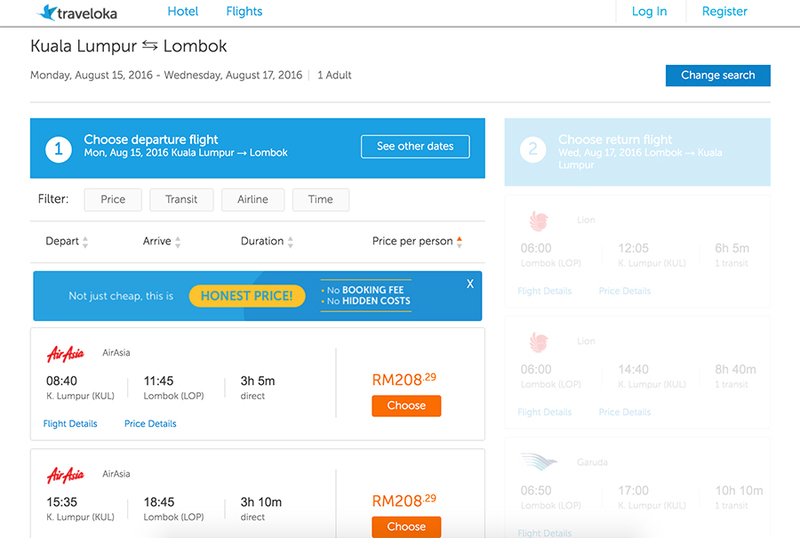 The airline options presented for my Lombok flight were Air Asia, Garuda Air, Lion Air, and Silk Air. They've basically thought of everything they can to make your booking process smooth and painless. They cover the booking of flights as well as hotels, all at affordable, super low prices. They've even included this feature called TravelokaQuick - where you save your credit card details and can complete a booking transaction in a quick minute. I hope you found these travel tips helpful, and if you ever go to Gili, tag me @emilyquak so I know you came from here! If you want to check out Traveloka, here is their website.